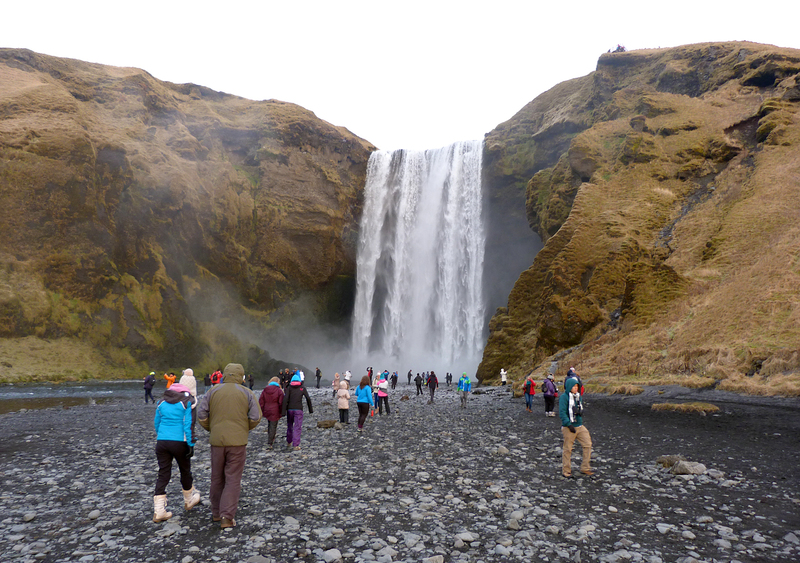 So during October half-term holiday, we took 27 pupils to Iceland for a few days, including, as you can see from the pic above, my daughter. We had a super time, and it was a very successful trip. From a wildlife point-of-view however, I was so, so, so, so, so relieved that I was able to go on a reccy trip in May (see link here for the blog posts on that one) because I barely saw any decent birds this time! If I hadn't been before, and this would have been my only trip, I would have left really disappointed. Not because of the amazing sights, because they were still astonishing, but because I only saw 24 species of bird, all of which I had seen in Guernsey before. 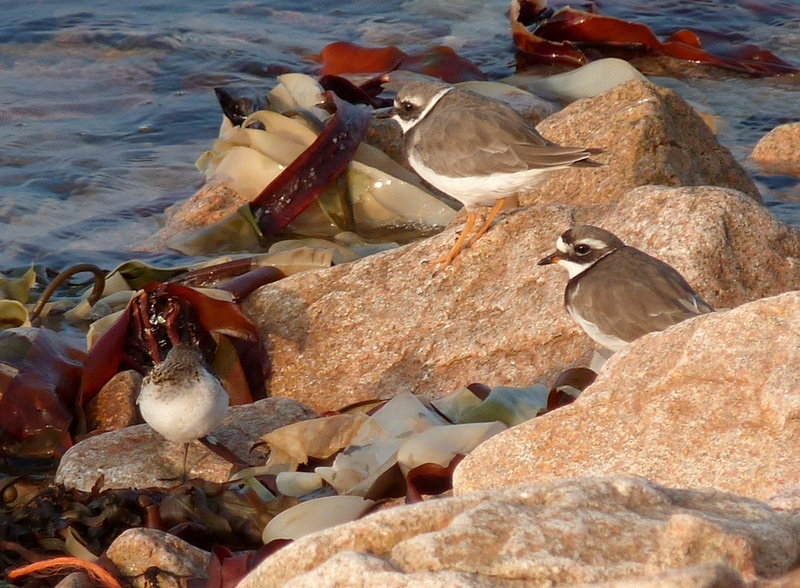 The reasons for this lack of sightings included: 1. time of year - it was now practically winter so a lot of species had already headed south, and what birds were left were mostly on the coast, and we spent most of the time away from the shore. 2. day length - of course much less light was available each day. 3. time spent looking - I learnt that being a teacher and a dad on the same trip is totally hard work! But the trip was great fun and all the kids were fabulous. I won't go into lots of detail as most of the places were a repeat of what I did in May. When we arrived, the first afternoon was wet, cold and windy and I was not looking forward to a few days of ganky weather. However, during the next day it became gradually better. 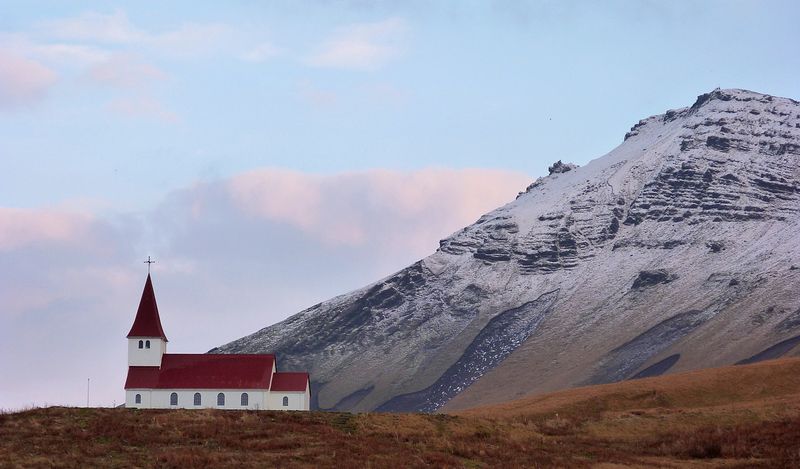 We travelled down to the south coast from Reykjavik, stopping at a few spots on the way. Hardly any birds were seen although Ravens were much more common than they were in the spring, and there were Blackbirds feeding on the grass of the roadsides. Redwings were seen in a few large flocks in the countryside, but little else was seen from the bus. 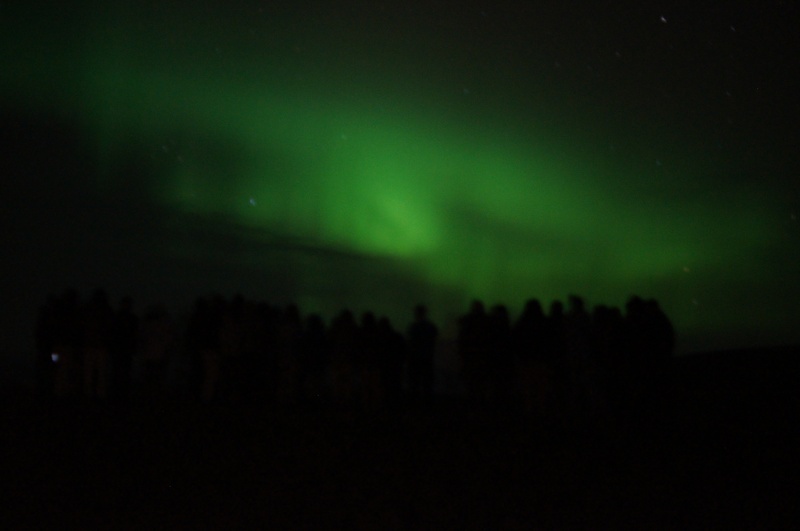 One of the reasons we went so late in the year was the chance of seeing the Aurora borealis, and around midnight on the second night, the clouds cleared and we managed to get to see some. They were definitely not spectacular and were quite faint. The photo below was taken by a teacher from a different school and I can't remember it looking that bright at the time! The next morning we spent a few hours on the coast at the southern tip of Iceland, and there were a lot more birds around. At the village of Vik there were hundreds, if not thousands of Fulmars flying round the cliffs, I had assumed that they all left the island at this time of year and were at sea. There were plenty of Redwing going overhead too. Heading onto the lava beach, I could see very little out to sea, but the fields in this area had quite a few Merlin perched on fence posts. There was also a large lagoon here and the bus drove very close to a flock of Whooper Swans and Greylag Geese feeding in the shallows. I also spotted a distant Great Northern Diver fishing. I'm sure that there may have been some interesting species around here if I had the chance to look. 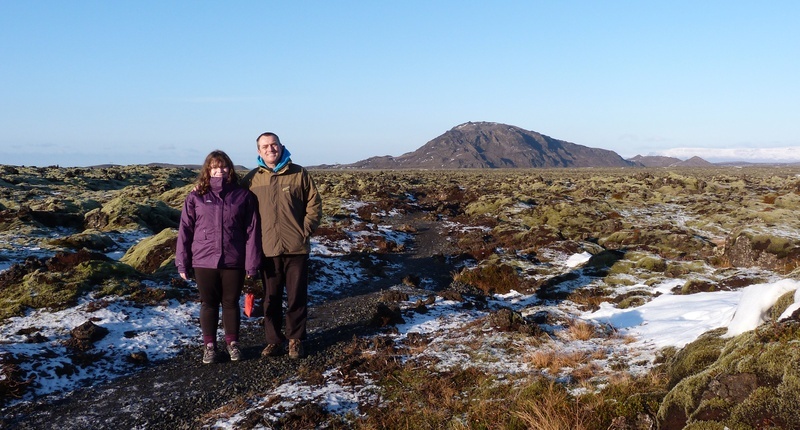 We headed back inland for the afternoon, away from the birds, but we drove into the Blue Mountains just outside Reykjavik which were really spectacular and full of snow. 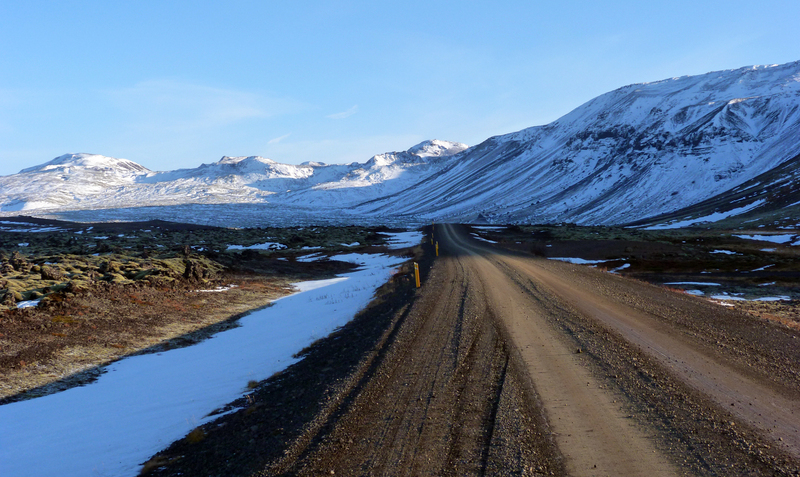 The lava field below the mountains was covered in few plants - mostly moss and dwarf willows - and in this inhospitable landscape, I saw 5 Snow Buntings fly along the roadside. 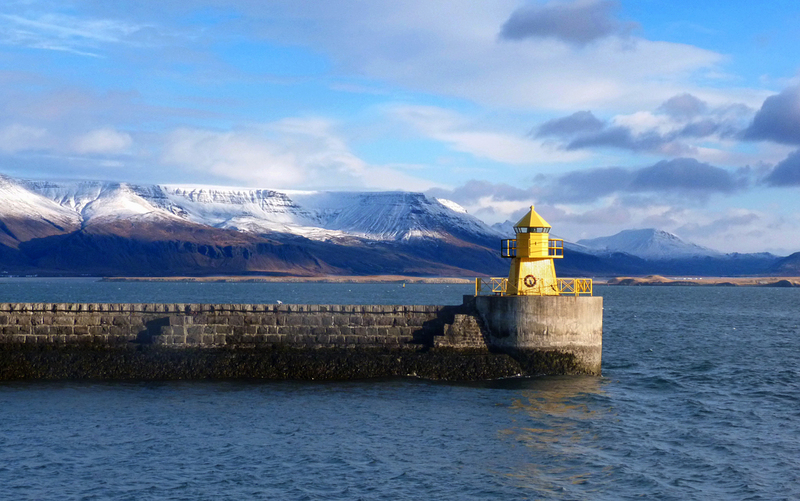 The next morning we took a boat out from Reykjavik harbour on a "whale-watching" trip. Being this late in the season, I was not really expecting to see any whales, and we didn't. However, I thought that we'd find a few dolphins, but these were absent also, the only cetacean I saw was a Harbour Porpoise close to the shore. I was on deck the whole time scanning for birds but I did not see anything really exciting. 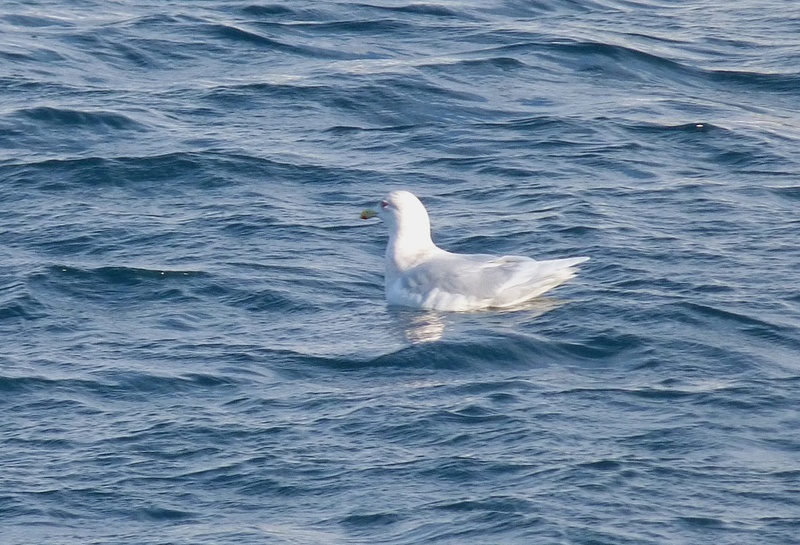 I thought I stood a chance of something good out at sea but it was mainly lots of gulls - including lots of Kittiwake and Glaucous Gulls - with a few Guillemots and Razorbills. 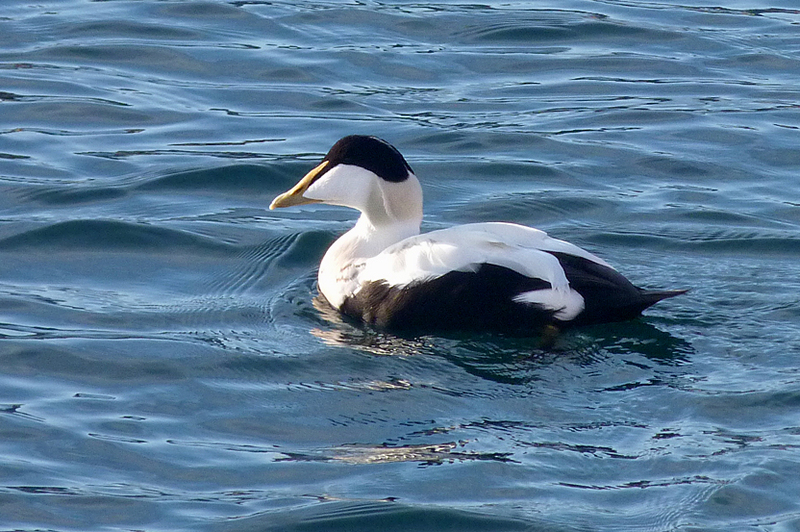 There were a few Eider in the harbour as we returned. The rest of our final full day was spent inland and the only species I saw was Raven I think. On our final morning we had a walk around Reykjavik city centre and a small flock of Redpoll flew into some trees. 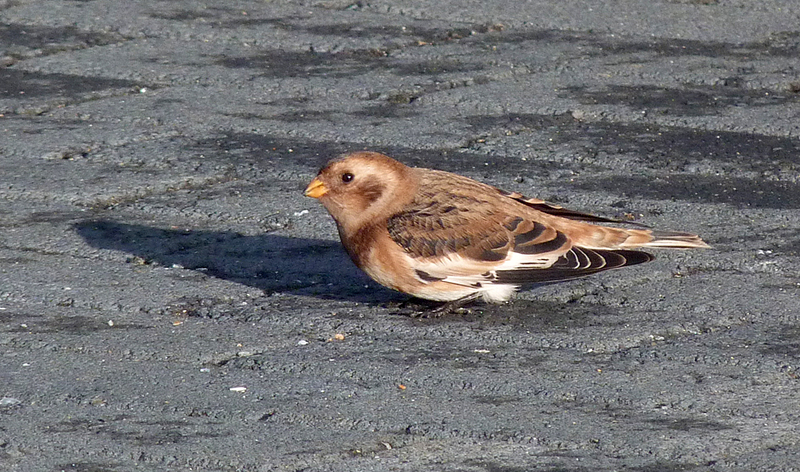 My final bird was a Snow Bunting in the car park at the Blue Lagoon. So, one or two nice birds but quite frustrating in that there was clearly lots of great birds really close by, but I never got the chance to see them - especially that elusive Gyrfalcon, grrr. Well, October is more or less over, and I gave it the best welly I could. So much so that I didn't stop to take any photos at all this month. I managed a morning round Pleinmont three times in the last few weeks, plus popping in somewhere most days either in my lunch hour or after school. So, as much time as I could spent in the field and a few decent birds seen, but no megas unfortunately. The first trip round Pleinmont was on 5th Oct and this was the first obvious day of late autumn migrants, with Meadow Pipits in the hundreds and at least 20 Skylarks seen. Swallows were also passing through, and I also had 3 Grey Wagtails and 4 Firecrests, plus a Reed Bunting pretending to be rare in the top fields. The best bird was a juvenile Rose-coloured Starling high up on the TV mast that was pointed out to me by the RSPB group who had just spotted it, but unfortunately it immediately flew off distantly. The next Pleinmont trip was on 12th Oct and was quite quiet for the time of year. There were a few Skylarks milling about and the best bird on the tops was a Mistle Thrush by the camping field. In the valleys there were quite a few Chiffchaffs plus two Firecrests, and by late morning I headed out of Vau de Monel. As I walked up the road away from the VDM car park, I saw a bird flit across the road in front of me left to right, and into the small trees along the edge of the 'Chatsworth' lawn. It was quite a way ahead so I saw no detail but it was Robin-like, although a pale grey-brown colour, compared to the more rufous colour of that species. It looked very interesting and so I jogged up the road and realised it was still in the small roadside trees, as I saw glimpses of it hopping around the branches, quite warbler-like. After a short while of waiting, I watched the mystery bird move slowly higher and higher, but giving only poor views, despite it being about 5 yards from me. It finally hopped into a more open area and I could see it a little better. Its plumage was very plain with few distinguishing marks and I was just trying to work out what it was when it fanned its tail. 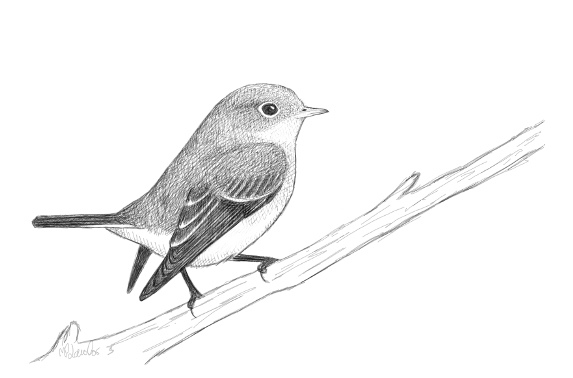 As soon as it did this, its identity became obvious, since the tail was almost jet black, with two bright white patches of white by the base - a Red-breasted Flycatcher! As soon as the ID clicked however, it took flight again, across the road in front of me, and left round the corner back into Vau de Monel valley. Despite a good hour of searching I never saw the bird again and, as far as I am aware, neither did anyone else, although the weather deteriorated around lunchtime, and I don't think it was extensively searched for. It was a little disappointing - great that I had found a rarity, but not great that I barely saw it. I am pretty sure that this is the first RBFly that I have found myself and it's a pity that I was unable to get even a record shot. (so below is a sketch of the last one I saw a couple of years ago instead). During the next week I had a couple of decent sightings at my Pulias patch. Firstly a Ring Ouzel flushed between rain showers on 15th, which I think is the first one I've seen there. Not a surprise since there was a huge influx into SE England just before this. Two days later, a young Common Tern was fishing off the headland, which has lingered up and down the west coast until the end of the month at least. The final Pleinmont trip was on 19th where the highlights were a group of 4 Ring Ouzels arriving in off the sea and another Mistle Thrush - not a very pleasing haul for a mid-October morning. 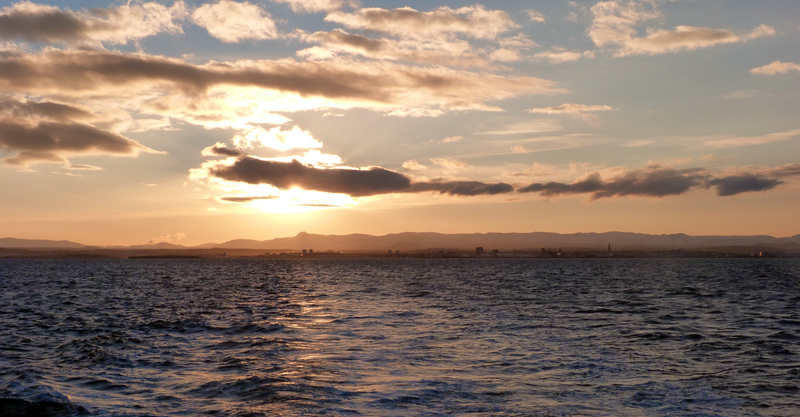 The final decent sightings of the month was the tail end of a decent seabird passage that I missed as I was at work. 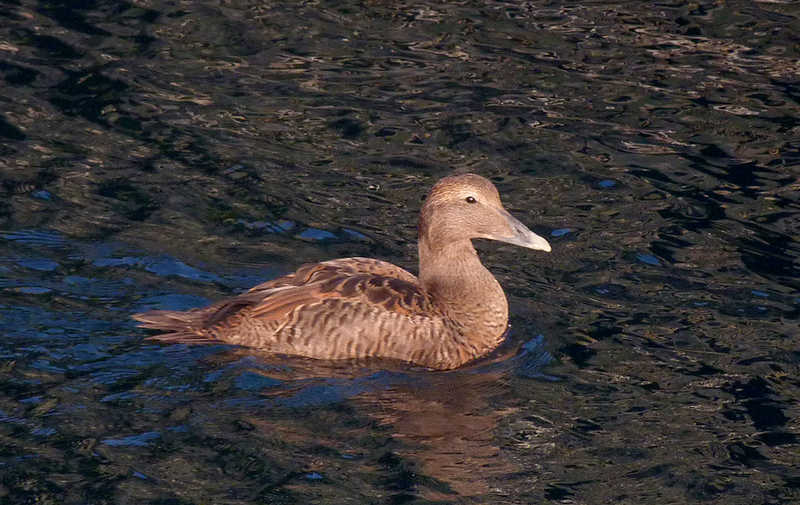 But off Pulias on 22nd, in just 20 minutes I had 3 Bonxies and a Balearic Shearwater. Another October passes without "The Boy" being found, but it's the expectation that keeps you going. I always expect to find something even though I generally don't. If I presume I'll find nothing when I set off, then I won't enjoy what I am doing. So for me, it's not the finding of rare birds that keeps me birding, it's the constant, exciting, unpredictable possibility of me finding a rare bird that does it. Mid-September continued with the easterlies and a bit of cloudy weather brought a few more migrants to Fort Hommet and Pulias on 17th and 18th. On these headlands in just a few short visits, I saw Spotted and Pied Flycatcher, a Redstart, Greenshank, Snipe, Water Rail, Whinchats, Yellow Wagtail and, best of all, I found my second Wryneck of the month. A flock of 15 Grey Herons came in off the sea, and I followed them right up the coast. 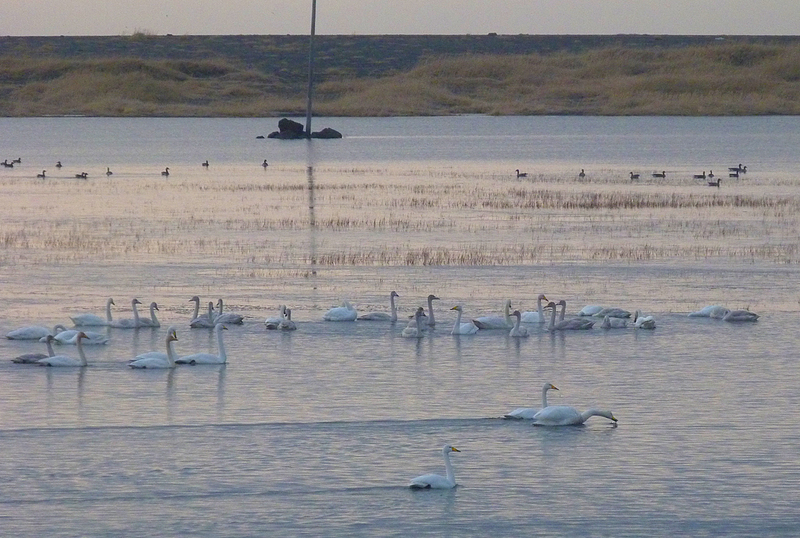 It was great birding, and the kind of week when you wish you didn't have to go to work. It had quietened down by the weekend. These sightings bring my "Patchwork Challenge" Hommet-to-Rousse patch year-total to 98 species, and my points tally to 130, with extra bonus points for finding a Wryneck. This is 90% of my target and I am sure I can hit it by the year-end. The second half of the month was not as good for migrants, with less numbers on the headlands. The species selection gradually changed, and the dominant species became Chiffchaffs, Meadow Pipits and finches. There always seems to be a small lull between the first phase of autumn and the second phase. The winds were variable and the temperatures were ridiculously warm for the time of year, still walking around in the sun in shirt sleeves at the start of October. My most satisfying sightings were actually from the garden. On 21st I was lucky to catch an Osprey flying over, first west then east. It was a little to the north of the garden and was not really a surprise since this bird had been hanging round the northern part of the island for a day or so, and I was looking out for it. It showed really well though and was the second record for the garden. The other garden sighting was very early in the morning one day before work. On 26th, in the gloomy half-light I noticed what a took to be a Robin perched on the small fence running along the garden path. After grabbing the bins though, it proved to be a female-type Redstart - a new species for the garden list. Most additions to the garden list are either flyovers or in neighbours' gardens, so to get a new one right by the kitchen window was most splendid. 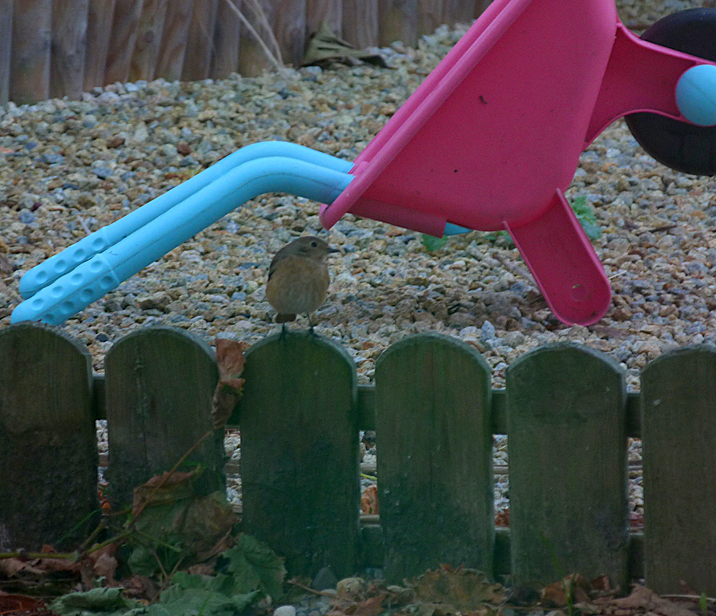 Redstart - garden, 26 Sep 14 - poor quality pic, but it was still dark almost! On 28th I had a few hours scouring Pleinmont and, despite the decent wind direction, there was practically nothing, apart from my first Skylarks and Firecrest of the autumn. I think that you can have too much of a good thing, and when an easterly wind persists and persists, its usefulness diminishes. This, plus the extended warm, sunny weather means we have been stuck in a bit of a rut. With the forecast for early October looking much more unsettled, I hope that this will shake things up a bit. 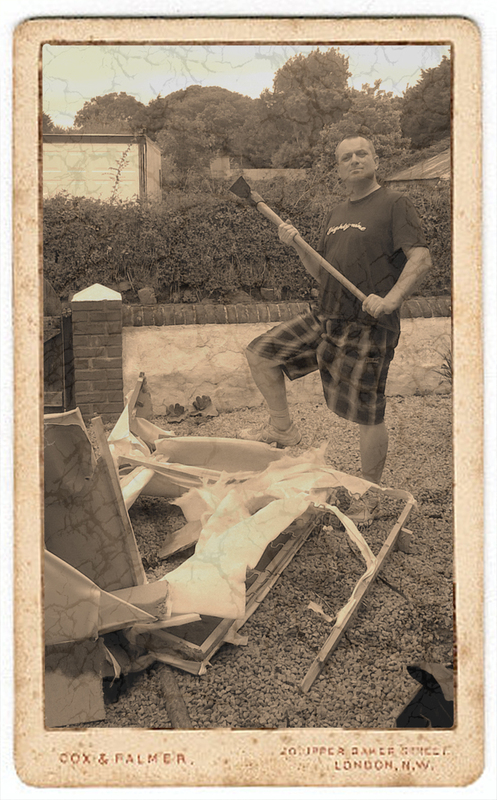 With no other wildlife pics to show, here is an old photo of a brave hunter standing with his vanquished adversary, the dangerous Sofarius couchii. After a prolonged battle of wits, the mighty sofa was finally brought down with a traditional combination of brute force and pick-axe. I am sure that a younger beast would have quite likely torn my throat out, but this old warrior had been worn down by many years of neglect and abuse, by both children and dogs, and, although I generally despise hunting, I had to put this old-timer out of his misery. May he rest in peace. The month started with a nice Greenshank on Pulias Pond on 1st, and when the easterly winds started there were quite a few migrants present at Fort Hommet in my lunchbreaks. 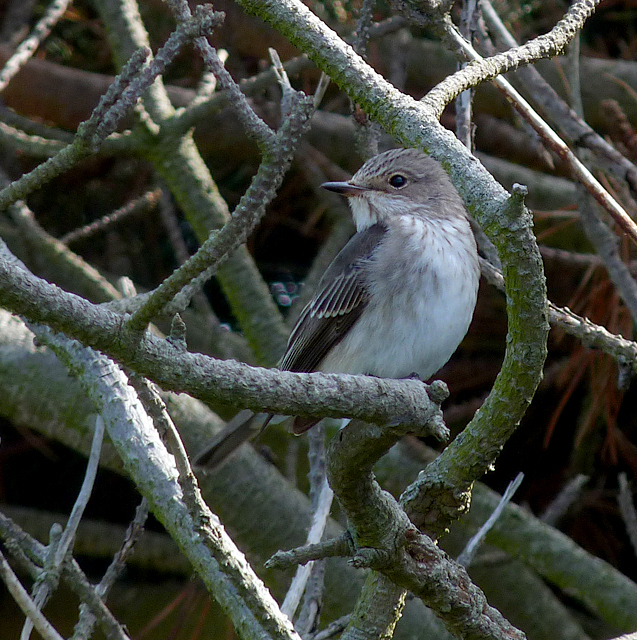 On 3rd I saw Pied and Spotted Flycatcher there although I dipped out on the Rosy Starling that had been seen earlier in the day. The next day a Whinchat joined the selection. After a long summer, it was great to see these birds on their way south. 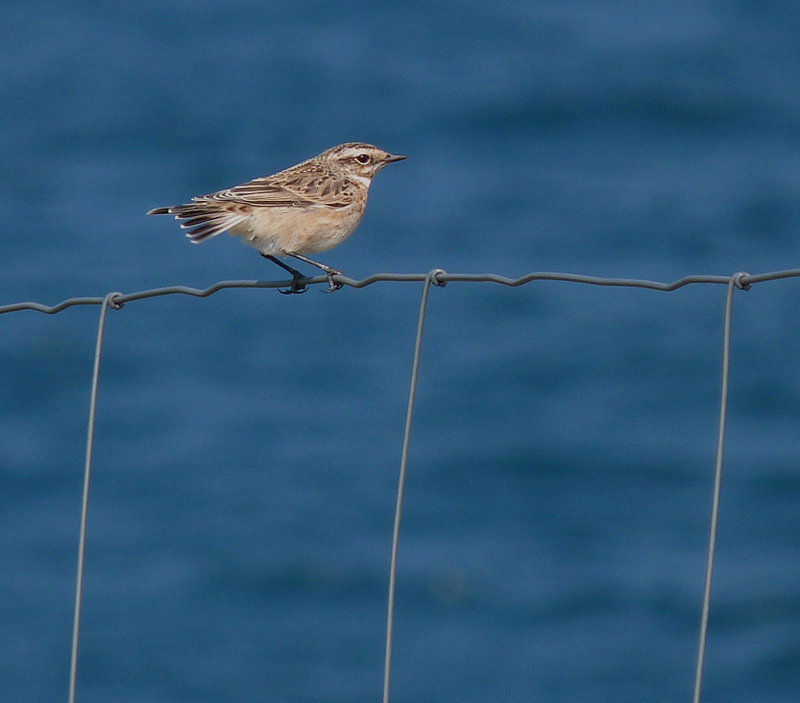 Whinchat - Fort Hommet, 4 Sep 14 - with the English Channel behind it (in more ways than one). 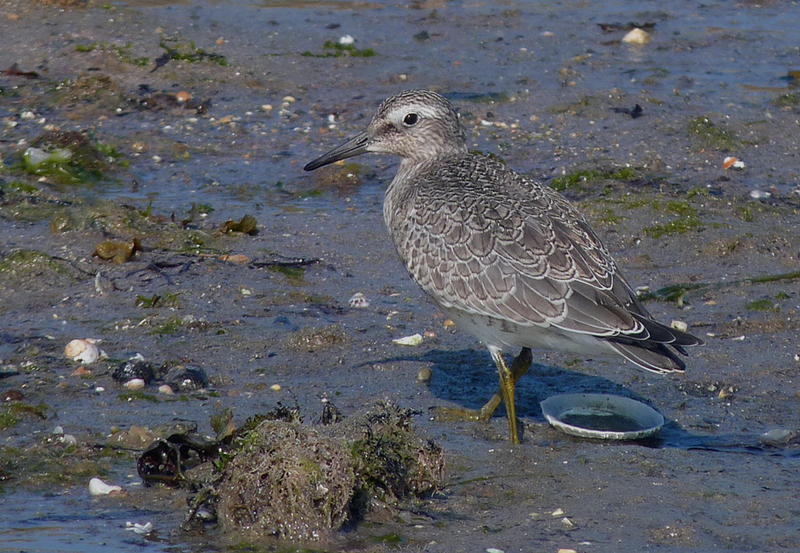 Also on 4th, on the way home from work, I stopped for a brief look at Pulias and trotting around the beach was a fabulous juvenile Knot. As is often the case with these northern waders, it was pretty unconcerned about me and I was to stalk it quite closely, despite the constant warnings from the local Oystercatchers. Quite a good bird for the patch, with just a few previous sightings, and then as I made my way back onto the headland, I flushed another decent bird from the pathside - a Wryneck. 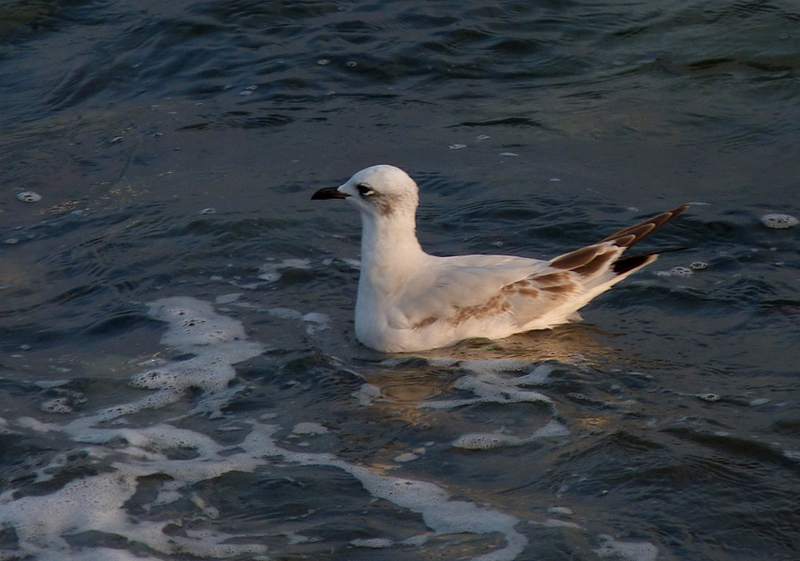 This proved to be a very elusive bird and I saw it again 4 days later, also just in flight, and then again on 11th. This time it landed briefly at the bottom on the brambles. 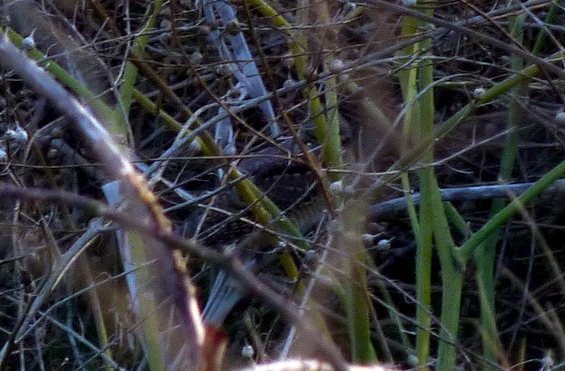 Wryneck - Pulias, 11 Sep 14 - A poor photo, but the best I could get! On Sunday 7th, I had a few enjoyable hours out at Pleinmont. The wind was still in the east, but with little cloud cover, I wasn't expecting a lot of birds, but actually there were more than I thought there'd be. I started at Mont Herault and there were plenty of Wheatears in the fields and upwards of 15 Yellow Wagtails flying around. A Whinchat perched up and at least 3 Tree Pipits called. 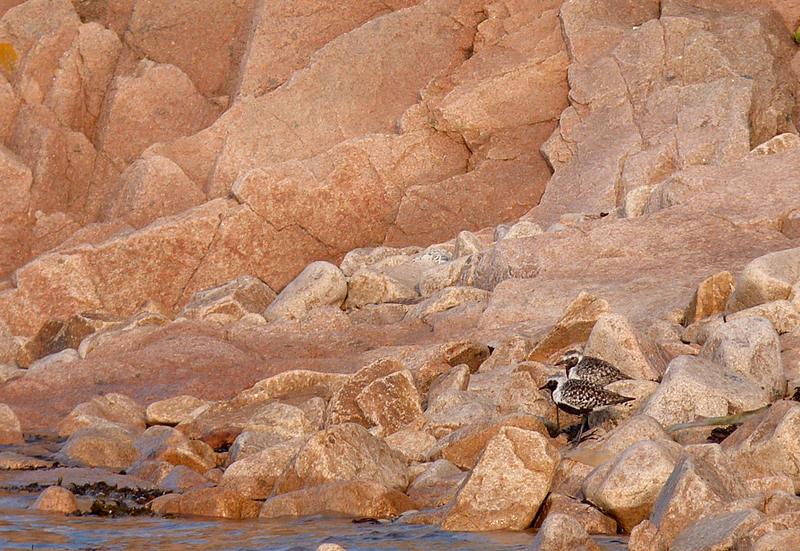 Early morning at Mont Herault is defintiely one of my favourite places to bird here on the island. One of the few spots where you feel you are out in a large, open space, away from other people. The fields here don't have fences and barriers and you can walk where you like. Totally loved it (until the dog-walkers appeared, to get in my way!). I moved across to the Pleinmont side of the headland, and there were even more birds over there and quite a few birders out and about too. Yellow Wagtails were numerous in the grassy fields and I reckon we must have seen 40 or more flying around. Julian spotted a nice Grasshopper Warbler in the weeds and we had really good views of it. 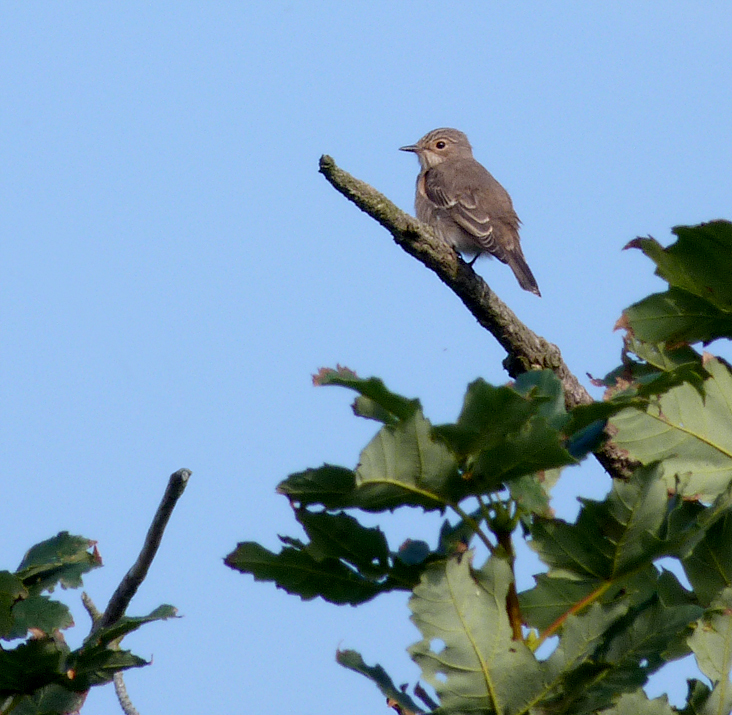 Over by the camping field there were a few Spotted Flycatchers and Redstarts. Altogether, a rather nice autumn morning's birding, but unfortunately, still no rarities. This week there has been a few more new arrivals on the patch. On 10th at Fort Hommet I saw the Little Stint that had been present a few days - only my second record for this coastal stretch, and there was also a Kingfisher flying round the bay. The next day at Pulias, in just a 10-minute dash round I saw Wryneck, Kingfisher, Med Gull and the first Grey Wagtail of the autumn. So overall, a pleasing start to a hopefully bird-filled couple of months. Such a nice selection of birds seen despite not being able to spend very much time out in the field. I often wonder how much I would see if I did have any time for proper birding at this time of year.